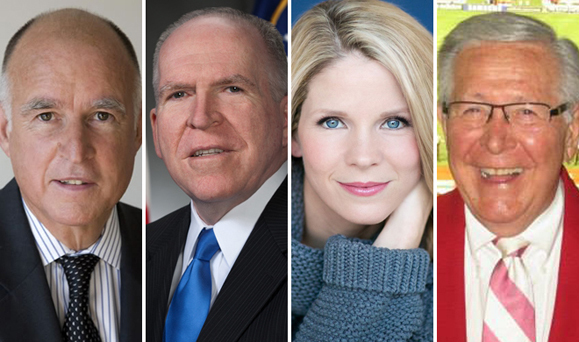 The 2018 Irish America Hall of Fame inductees: Governor Jerry Brown, John O. Brennan, Kelli O'Hara, and Dennis P. Long. On Friday, March 2, Irish America magazine will induct four new members to the Irish America Hall of Fame. The distinguished 2018 Hall of Fame inductees include Governor Jerry Brown of California; John O. Brennan, former director of the CIA; actress, singer and Tony Award-winner Kelli O’Hara; and Dennis P. Long, former president of Anheuser-Busch and member of the U.S. Soccer Federation’s Hall of Fame and the St. Louis Soccer Hall of Fame. Special guests include former inductees Loretta Brennan Glucksman, Grand Marshal of the 2018 NYC St. Patrick’s Day Parade, and Dr. William C. Campbell, recipient of the 2015 Nobel Prize in Medicine. Founded in 2010 in celebration of Irish America magazine’s 25th anniversary, the Irish America Hall of Fame honors the extraordinary achievements of Irish-American leaders, from their significant accomplishments and contributions to American society to the personal commitment to safeguarding their Irish heritage and the betterment of Ireland. The Irish America Hall of Fame is housed at the Dunbrody Famine Ship Experience in New Ross, County Wexford. For information on event reservations and advertising opportunities, please contact Kate Overbeck at kate@irishamerica.com. Governor Jerry Brown was born in 1938 in San Francisco, California, where his Irish ancestors put down roots following his great-grandfather, Joseph Browne’s immigration from County Tipperary. After graduating from the University of California at Berkeley and Yale Law School, the future governor went on to work as an attorney. Brown, whose father served as San Francisco district attorney, California attorney general, and later governor from 1959 to 1967, had always had political aspirations. He won his first stateside victory in 1970 when he was elected Secretary of State for California. Four years later, he followed in his father’s footsteps and was elected to his first two terms as governor in 1974 and 1978 — becoming the youngest California governor to be elected in 111 years. Brown thrice ran as a candidate for the Democratic nomination, in the 1976, 1980, and 1992 U.S. presidential elections, and served as Chairman of the California Democratic Party (1989-1991). Former Director of the Central Intelligence Agency, John O. Brennan, was born in Jersey City in 1955 to Irish immigrants from County Roscommon. Brennan graduated from Fordham University with a bachelor’s degree in political science. He spent his junior year studying the Middle Eastern and learning Arabic at the American University in Cairo, Egypt. He went on to earn a master’s degree in government with a concentration in Middle Eastern studies from the University of Texas. Brennan began his service in government in 1980 with the CIA, where he spent most of his early career in the agency’s main analytic arm, the Directorate of Analysis. In 1994 and 1995 he served as the agency’s intelligence briefer to President Bill Clinton. While working as the deputy executive director from 2001 to 2003, Brennan began leading a multi-agency effort to establish what would become the National Counterterrorism Center before deciding to retire from the CIA in 2005 to work in the private sector. In 2009, President Barack Obama appointed Brennan as Assistant to the President for Homeland Security and Counterterrorism. In 2013 the White House named Brennan director of the CIA, where he served for the duration of Obama’s tenure. One of Broadway’s great leading ladies, Kelli O’Hara grew up in Oklahoma in an Irish American family. O’Hara’s great-grandfather, who was born in County Clare, arrived in Oklahoma during the time of the Land Rush of 1889 and her family remain proud of their Irish roots in the state to this day. After receiving a degree in opera from Oklahoma City University and winning the State Metropolitan Opera Competition O’Hara decided to move to New York where she enrolled in the prestigious Lee Strasberg Institute. O’Hara made her Broadway debut in 2000 in a revival of Jekyll & Hyde. Her first of six Tony nominations was for her appearance in The Light in the Piazza, which premiered on Broadway in 2005. In 2015, O’Hara won her first Tony – Best Leading Actress in a Musical – for her portrayal of Anna Leonowens in the critically acclaimed revival of The King and I.
O’Hara has also appeared in a number of movies and TV shows, as well as performing with numerous orchestras across the country. She released two solo albums and sold out her solo shows at both Carnegie Hall and Town Hall. O’Hara will return to Lincoln Center for the Metropolitan Opera’s 2017-18 season. The Tony winner will sing the role of the spunky maid Despina in a new staging of Mozart’s Così fan tutte. Dennis P. Long was born in Chicago and grew up in an Irish neighborhood in St. Louis where his great-grandparents, originally from County Kerry, had settled. He attended the local St. Colmcille’s parish school where he was further taught about his Irish cultural heritage, solidifying a life-long appreciation for his roots. Long’s professional career began humbly as an office boy at Anheuser-Busch in 1953. But it was the start of a lifelong commitment to the company that would eventually see him rise to president and chief operating officer. In 1986, under his leadership, Anheuser-Busch became a sponsor of the Irish Derby, an annual event that takes place at the ancient Curragh race track in County Kildare and one of Europe’s top horse races. Long also used his position at the world’s largest brewery to support his passion – soccer. As president of the company, he made Anheuser-Busch a global sponsor of the FIFA World Cup and major supporter of the USSF (United States Soccer Federation) bid for the 1994 World Cup tournament, which ended up being hosted in the U.S.
A major supporter of the local soccer scene in St. Louis, Long developed Budweiser’s worldwide support for the sport throughout his tenure at the company. As chairman of the committee that developed the St. Louis Soccer Park, Long was committed to creating something unique. In the 1980s, the St. Louis Soccer Park became a frequent site of U.S. national team games, including World Cup qualifiers. In 2011, as part of the 35th annual CBC High School Soccer Tournament celebrations, the St. Louis Soccer Park honored Long for his commitment and vision over the years, officially naming the complex’s main soccer pitch the Dennis P. Long Field. A member of the United States Soccer Federation’s Hall of Fame and the St. Louis Soccer Hall of Fame, Long will now be inducted into the Irish America Hall of Fame. Since its inception in October 1985, Irish America has become a powerful vehicle for expression on a range of political, economic, social, and cultural themes that are of paramount importance to the Irish in the United States. It has helped reestablish the Irish ethnic identity in the U.S. (34.7 million according to the last U.S. census) and highlights the best political and business leaders, organizations, artists, writers, and community figures among the Irish in America. This is a wonderful group. Irish America always seems to honor the right people. I’m very proud of Irish America Magazine. I, too, Bill Daley. Did you ever “come home”?